Though it’s sad that another summer is officially in the books, Fall 2018 has already brought a bevy of exciting initiatives to the Joe Andruzzi Foundation! Over the past month, we’ve asked everyone to mark their calendars for our 11th Annual Gala, put out the bat-signal for our 2019 Boston Marathon superheroes, and relaunched our Goal Line Giving campaign with Empower Retirement. But that’s not everything that kept JAF busy in September – read all about the month that was below! 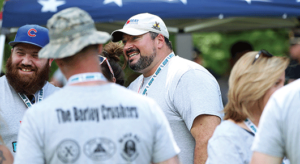 Team up with the Joe Andruzzi Foundation as we play it forward and bring on the next ten! 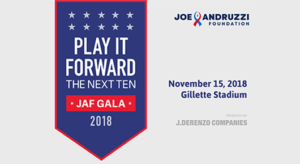 Be sure to save Thursday, November 15, 2018, in your calendars for JAF’s 11th Annual Gala, presented by The J.Derenzo Companies! Check back next week for details on how to score tickets to our biggest event of the year! For more information, click here. We are now accepting applications for those interested in running the 2019 Boston Marathon for the Joe Andruzzi Foundation! 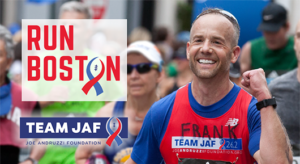 Team JAF has once again been selected to participate in the 2019 John Hancock Non-Profit Marathon Program, and on April 15, 2019 – Marathon Monday – our runners will take strides against cancer through the streets of Boston for the ninth straight year. Team JAF welcomes applications from those seeking a charity bib, as well as runners who have received entries through qualification or outside invitations. Those seeking charity bibs are required to raise a minimum of $8,500 for the Foundation, while qualified and invitational runners must pledge to exceed $2,000 in order to become a member of Team JAF. To fill out our online application, visit: http://bit.ly/teamjaf19. Click here to learn more. 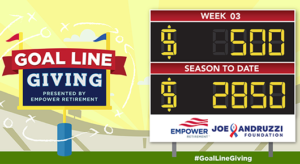 The Joe Andruzzi Foundation has, for the second year, teamed up with Empower Retirement to tackle cancer’s impact on the football field this season through our Goal Line Giving campaign! 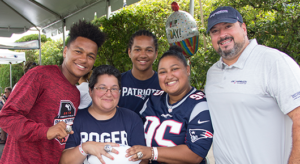 For every point New England scores during the 2018 regular season, Empower Retirement will donate $50 towards the Joe Andruzzi Foundation’s mission of providing financial assistance to cancer patients and families – helping them focus on recovery, not bills. Through three weeks, New England has scored 57 points, equaling $2,850 in Goal Line Giving donations – and we’re hoping the Pats light up the scoreboard this Sunday against Miami! Read all about Heather’s cancer journey in the latest JAF Patient Story. First, be sure to review JAF’s brand-new Supporter Hosted Fundraising Toolkit to discover fundraising campaign ideas and resources available to help you reach your goals. Next, feel free to reach out to our event staff (events@joeandruzzifoundation.org) with any questions you still may have before applying. For complete info on how you can get your fundraising idea off the ground, click here.